The Heartworm Hotline column is cosponsored by Today’s Veterinary Practice and The American Heartworm Society (heartwormsociety.org). Each article presents a question or questions on a particular area related to heartworm infection, prevention, diagnostics, and/or treatment. What role does doxycycline play in the management of heartworm disease? The exact role of doxycycline in the management of heartworm disease (HWD) is not well established. 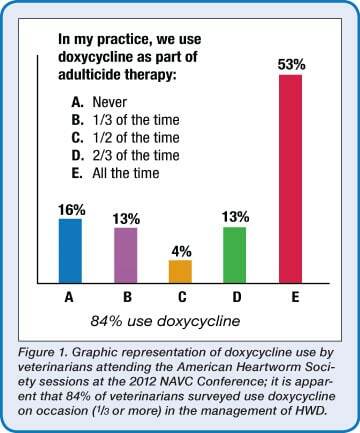 However, virtually all experts in the field would agree that doxycycline has a role in therapy and most U.S. veterinarians incorporate it into their management of HWD (Figure 1). What is the optimum concomitant therapy (ie, most data to date have been generated using concomitant administration of ivermectin)? What is the exact dosage, time-point for initiation, and duration of therapy? What are the risk and cost to benefit ratios? In which specific disease stage(s) is doxycycline useful? The benefits of doxycycline result from its ability to remove or reduce the burden of Wolbachia, a rickettsial organism that exists in a symbiotic relationship with heartworms (and other filarids), occupying the reproductive tract and lateral chords of the host parasite (Figure 2). Wolbachia are necessary for the parasite (in this case, Dirofilaria immitis) to develop, thrive, reproduce, and maintain infectivity. Doxycycline has been used to (presumably) rid the parasite of Wolbachia organisms; therefore, D immitis organisms do not thrive, may deteriorate and die, and have reduced reproductive potential, which helps manage HWD in infected dogs and reduces potential for infection in other dogs. The results of these studies suggest that the combination of doxycycline and ivermectin is (slowly) adulticidal in dogs with D immitis, which indicates that doxycycline enhances therapy for the soft- or slow-kill method. This elimination is relatively fast, but not so rapid that therapy results in the adverse, shock-like reactions seen with rapid destruction of large numbers of microfilariae. In addition, subacute removal of microfilariae lessens the chance of macrocyclic lactone resistance, especially when the practitioner is forced to use the slow-kill method due to owner finances or difficulty attaining adulticide (ie, melarsomine). • If the 30 days of administration begin on day 40 of infection, however, the effect is partially lost, with 2% of L3 reaching adulthood. Therefore, in addition to reducing adverse effects from heartworm death, doxycycline begun on the day of diagnosis will help close the potential seasonal window of continuous infection, which means that, during certain times of year when exposure is continuous (warmest months), the host may have developing larvae of all stages. Figure 3. 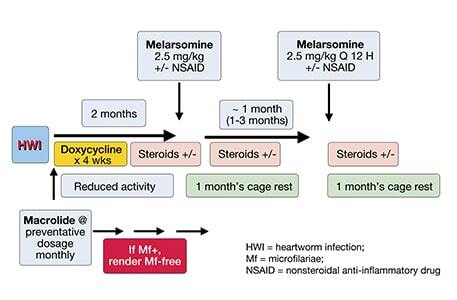 My preferred approach to adulticidal therapy in virtually all (severely affected or not) dogs infected with heartworms includes 3 doses of melarsomine, unless otherwise dictated by owner finances. Macrolide prophylaxis is begun at the time of diagnosis, if not already in use. Note: If microfilaremic, care should be taken to prevent or observe and treat adverse reactions, based on microfilarial numbers and macrolide used. It is imperative to eliminate microfilariae from patients receiving macrolides to reduce the chance of resistance to macrocyclic lactones developing. To view a similar algorithm depicting the American Heartworm Society’s therapy recommendations, see the 2012 Guidelines of the American Heartworm Society, Table 3, at heartwormsociety.org. Author Recommendation: I advocate a second month’s delay in adulticidal therapy to allow the parasite to deteriorate maximally and, thereby, further reduce the pulmonary reaction to worm death. Enhancement of vermicidal efficacy of ivermectin, if using slow-kill method. In summary, it appears that doxycycline not only has a role in the management of heartworm infection, but that this role will continue to grow and be further refined. Should We Worry About Resistance? Concern has been raised about the potential development of bacterial resistance if doxycycline is administered in all cases of HWD. In my opinion, this concern is worth considering as doxycycline is widely used and valuable to our profession (and physicians) for treatment of a variety of infectious processes. On the other hand, concerns for resistance generally occur when drugs are used at suboptimal dosages and durations of therapy. Neither of these result from the current treatment recommendations for HWD. Figure 3. Modified from Atkins CE, Miller MW. Is there a better way to administer heartworm adulticidal therapy? Vet Med 2003; 98:310-317. McCall JW, Genchi C, Kramer L, et al. 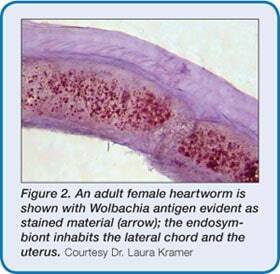 Heartworm and Wolbachia: Therapeutic implications. Vet Parasitol 2008; 158:204-214. Rossi MI, Pavia J, Mendes-de-Almeida, et al. Effects of doxycycline on the endosymbiont Wolbachia in Dirofilaria immitis (Leidy, 1856)—naturally infected dogs. Vet Parasitol 2010; 174:119-123. Bazzocchi C, Mortarino M, Grandi G, et al. Combined ivermectin and doxycycline treatment has microfilaricidal and adulticidal activity against Dirofilaria immitis in experimentally infected dogs. Int J Parasitol 2008; 38:1401-1410. Kramer L, Grandi G, Leoni M, et al. Wolbachia and its influence on the pathology and immunology of Dirofilaria immitis infection. Vet Parasitol 2008; 158:191-195. Bowman DD, Atkins CE. Heartworm biology, treatment, and control, in small animal parasites: biology and control. Vet Clin N Am Small Anim Pract 2009; 39:1127-1158.
heartworm disease (Dirofilaria immitis). Vet Parasitol 2010; 169:347-351. Kramer L, Grandi G, Passeri B, et al. Evaluation of lung pathology in dogs treated with doxycycline or a combination of doxycycline and ivermectin before administration of melarsomine dihydrochloride (Immiticide). Vet Parasitol 2008; 158:191-195. McCall JW, Kramer L, Genchi C, et al. Effects of doxycycline on early infections of Dirofilaria immitis in dogs. Vet Parasitol 2011; 176:361-367. Guidelines of the American Heartworm Society, 2012; heartwormsociety.org. Clarke Atkins, DVM, Diplomate ACVIM (Internal Medicine & Cardiology), is the Jane Lewis Seaks Distinguished Professor of Companion Animal Medicine at North Carolina State University. He is also a member of the Today’s Veterinary Practice Editorial Peer Review Board and American Heartworm Society’s Executive Board. Dr. Atkins received the 2004 Norden Award recipient for excellence in teaching. His research involves canine and feline heartworm disease and pharmacologic therapies for cardiac disease. Dr. Atkins received his DVM from University of California–Davis and completed his internship at Angell Memorial Animal Hospital in Boston, Massachusetts.